The last thing any orthodontic patient wants to hear is that they need more gear in their mouth beyond brackets, wires, or aligners. Orthodontic appliances, however, make all the difference when it comes to achieving a straight smile. And, you’ll discover, they’re not so bad whether they’re doing hard work on their own or giving braces a boost. 1. They make braces work better and faster. Sometimes, wearing an orthodontic appliance means you won’t need a full course of braces at all. Braces for kids often include a round of interceptive orthodontics. This treatment addresses existing or developing alignment problems in the hopes that future orthodontic treatment can be simplified or potentially eliminated. Expanders, upper braces, a space maintainer, or a tongue crib are measures that may be used to manage bite and guide the jawbone while the child’s jaw is still growing. This type of treatment is limited and usually lasts around a year. 2. They come in all shapes and sizes and colors. 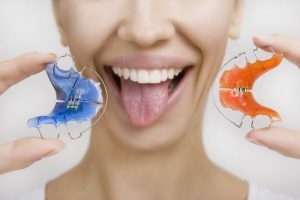 Retainers: You know them and you’ll learn to love them because retainers keep your newly straightened teeth right where they belong, and they can be made in fun colors. Expanders: This important appliance helps your jaw grow to the right width so your mouth has room for all those erupting teeth and crowding is kept to a minimum. Herbst Appliance: This tool encourages the development of the lower jaw so it aligns with the upper jaw and is usually used alongside braces. Carriere Distalizer: The name may be fanciful but the purpose is significant, as the distalizer corrects the braces wearer’s bite before the teeth are straightened. Elastics: Rubber bands – also known as elastics in braces-speak – come in an array of colors so you can show your personality. 3. Sometimes orthodontic treatment just requires a little boost. There are Invisalign aligners but not really any Invisalign appliances – at least not until treatment is complete and you must wear a retainer. There are, however, Invisalign attachments. These little “bumps” are tooth-colored raised areas that are bonded to your teeth so the aligners fit better. Invisalign aligners are designed to move certain teeth at certain times, but if that movement can be more effective with the help of attachments, your Woodinville Invisalign provider will opt for this treatment. The attachments are unnoticeable and they will be sanded off after orthodontic treatment is complete so no one will ever know they were there. What Orthodontic Appliances Will Your Child Need? Kids should be evaluated by an orthodontist by age 7. They will be right in the middle of losing teeth and getting adult teeth, but this is the best time to find out whether early orthodontic intervention is necessary. Interceptive orthodontics, which typically use orthodontic appliances, can be the difference between a long or short course of braces as a tween or teen. Contact Soleil Orthodontics today to schedule your consultation with orthodontist Dr. Soleil Roberts in Woodinville, Washington. Learn more about orthodontic appliances and all that braces entail.